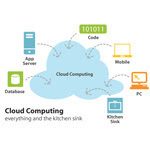 Cloud Computing is one of the most talked about concept in Technology. In simple terms it can be explained as Internet computing. Let’s see how Cloud Computing works. When we say that the computing involves working on the net, in simple terms it implies that you do not install any of the software programs or upgrade your PC’s hardware for it to comply with those programs. The internet would take care of both the software as well as the hardware. Since both of them are virtual, this computing is referred to as, within the cloud or Cloud computing. Just to give an example it would mean, instead of installing the Microsoft Word, you can access your word applications via Google docs, available to us on the Internet. Thus this “cloud” manages all your applications in a similar manner. 1. We don’t have to worry about purchasing expensive software and installing them on our PC. This way we would save a lot of money. Any software can be accessed remotely for us to use at our convenience. There would be no compatibility issues as the software is not running on our PC. 2. We save a lot of time, that otherwise would be used to install and update every software, present on the PC. Just the way our email client like Hotmail, Yahoo and Gmail gets updated automatically, same would be the case with each of these applications. 3. It is safe and risk free. Today when you need to take the responsibility of backing up your data, lest the hard drive crashes, in Cloud computing, the respective vendor will do the needful. We don’t have to worry for any of it. 4. Server issues are not new. We’ve all had our share of trouble with them. In this scenario, Cloud computing would take care of them again. In the first place, there won’t be any server issues, because there will be multiple servers ready to take over, even if one of them crashes down. Cloud Computing as we can see forms the base for the future of technology and has lot of benefits. There seems to be a lot in it to look forward to and seeing the impact that it has already created it is bound to take the technology world to new heights.